I LOVE novena candles-I do not do a working without them! I have been printing my own images for the deities or spirits I work with for years and years. Then dressing the candle and creating a custom oil to be used in conjunction with the dressed candle over the 120 hour burn time. Incredible results! 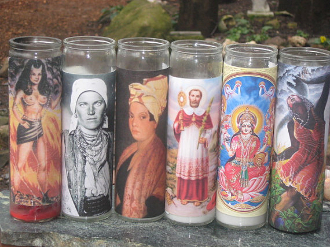 I started doing this because I found that most of the deities or spirits I worked with weren't available in a novena candle. The benefit to this is that you can get awesome images that you could never find anywhere else which makes them super special. The actual candle itself is white, in order to accommodate any deity or spirit. Above are samples of candles I have made for my own boveda and altar to give you an idea of what is possible. You will receive ONE dressed novena candle with the deity or spirit image of your choice. Simply leave me a note in the "note to seller" and tell what deity or spirit you would like an image of and perhaps descriptions of what you like or don't like in the depictions. Your candle may take up to 2 weeks to fully customize depending on the obscurity of the deity or spirit as I must research images, oil and dressing recipes if I do already know them. feedback; "So usually I use the plain little white 7 day candles one can buy anywhere. Oh silly me. How foolish I've been. Moma Sarah's candles are DIVINE. They smell wonderful, they burn silky smooth, and you can feel the energy of the room change. It is not even fair to try to compare to them to regular novenas. It's also worth noting that the glass is much sturdier and a higher quality than the average novena." Shipping costs are higher on this item because it is a very heavy, glass item. The pictures above feature some of the custom candles I have done.